Powerful storms swept through the eastern United States Friday night, resulting in at least 12 deaths and leaving more than three million without power. 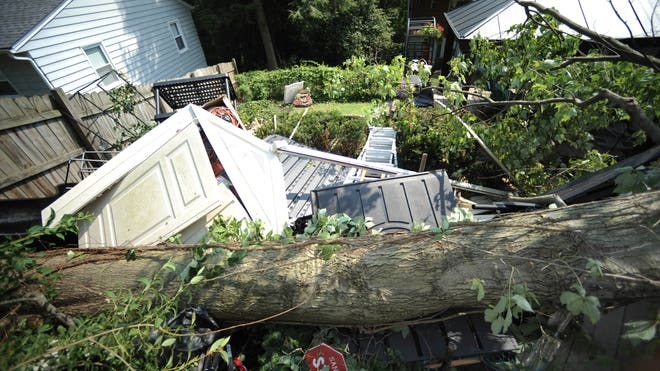 WASHINGTON – Utility crews untangled downed power lines and tree limbs Sunday, working to get the electricity turned back on for millions of people facing a second day of 100-degree temperatures without modern conveniences like air conditioning and refrigeration. On Saturday, many people flocked to places like malls and movie theaters in the hope the lights would be on again when they returned home. Utilities were slowly making progress, but more than 3 million people still had no electricity and could only watch their thermostats climb. It could be several days before all the power outages are restored. Strong winds from the storms late Friday toppled massive trees onto cars and blocked roads, and officials asked residents not to drive until they could clear debris from the streets. When a hurricane is lumbering their way, state officials have time to get extra personnel in place so they can immediately start on cleanup. That wasn't the case with this storm, known as a derecho -- a straight-line wind storm that sweeps over a large area at high speed. "Unlike a polite hurricane that gives you three days of warning, this storm gave us all the impact of a hurricane without any of the warning of a hurricane," Maryland Gov. Martin O'Malley said. The bulk of the storm damage was in West Virginia, Washington and the capital's Virginia and Maryland suburbs. At least six of the dead were killed in Virginia, including a 90-year-old woman asleep in her bed when a tree slammed into her home. Two young cousins in New Jersey were killed when a tree fell on their tent while camping. Two were killed in Maryland, one in Ohio, one in Kentucky and one in Washington. The power outages were especially dangerous because they left the region without air conditioning in an oppressive heat wave. Temperatures soared to highs in the mid-90s Saturday in Baltimore and Washington, a day after readings of up to 104 degrees were reported in the region. Yet another day of temperatures reaching 100 degrees was forecast for much of the region Sunday. Three Baltimore City fire companies set to permanently close this week were staying open several more days to help cope. New Jersey Gov. Chris Christie ordered the National Guard to deliver fuel for generators and fresh water to stricken areas. He reported that power had been restored to such tourist areas as Atlantic City's casinos. In West Virginia, 232 Amtrak passengers were stranded Friday night on a train blocked on both sides of the tracks by toppled trees. Brooke Richart, a 26-year-old teacher from New York City, was among the passengers stranded for 20 hours. She read half a book and took walks outside the train, which had light, air conditioning and food the entire time. But she called the wait "trying." "Thankfully we could go in and out of the train because we were there so long. If you wanted to stretch your legs or take a walk, you could," she said. Amtrak spokesman Steve Kulm said passengers were taken away by buses Saturday night. Meanwhile, officials focused on the most vulnerable residents: children, the sick and the elderly. In Charleston, W.Va., firefighters helped several people using walkers and wheelchairs get to emergency shelters. One of them, David Gunnoe, uses a wheelchair and had to spend the night in the community room of his apartment complex because the power -- and his elevator -- went out. Rescuers went up five floors to retrieve his medication. Some sought refuge in shopping malls, movie theaters and other places where the air conditioning would be cranked up. Others simply tried to make the best of a bad situation. In the Columbus, Ohio, suburb of Dublin, Lori Schaffert said her household borrowed a generator from a friend and was alternating it between the refrigerator and freezer while using flashlights and battery-operated lanterns for light. Her 5-year-old daughter and a neighbor friend played board games and helped her make pickles from their garden's cucumbers. "You come to appreciate the simple life a little more in these times," Schaffert said. Some major online services also saw delays and disruptions. Netflix, Instagram and Pinterest resorted to using Twitter and Facebook to update subscribers after violent storms across the eastern U.S. caused server outages for hours. Netflix and Pinterest restored service by Saturday afternoon. Instagram used its Facebook fan page to communicate with users of its photo-sharing service. It posted a message on Saturday morning that blamed the electrical storm for the outage that sent its engineers scrambling to restore service.